We are participating in a Spring Week with a few other fabulous bloggers. Today is our turn. We decided to share an oldie but a goodie. Our Easter countdown. Especially when I get to teach my kids something in the process – double bonus! My friend Carrie shared with my craft group this great idea that takes you through the last little bit of Christ’s life with Bible references as you countdown to Easter. The best part? It is SIMPLE! I thought you might ask. Each egg is filled with a Bible reference about Christ’s last days and a symbol that goes along with the verse…to help us visual learners. Most of the items you can just find around your house – or send your kids on a treasure hunt…even better! Or wrap one up for a friend. I put mine in one of those egg holders you find all over this time of year. Now it is a decoration also. You still have almost a week to get one put together before it is time to start the countdown. 8. Jesus, when he had cried again with a loud voice, yielded up the ghost. 9. Then Joseph (a rich man) went to Pilate, and begged the body of Jesus. his own new tomb, which he had hewn out in the rock. 10. And he rolled a great stone to the door of the sepulcher, and he departed. made the sepulcher sure, sealing the stone, and setting a watch. 12. HE IS RISEN; He is not here: behold the place where they laid him. I would love to hear how YOU countdown or how you keep the TRUE meaning alive. And if you are looking for something else fun to do with plastic eggs, you HAVE to check out what AmberLee over at Giver’s Log did with hers…your creativity kills me, Amber! A special thanks to all the fabulous ladies participating in the Spring Fling Week! Liz, Kellie, Gina & Charlotte . Seriously, some creative geniuses. Make sure to check out their Spring posts this week! Love this!! Such a great idea and something that I’ve never seen before. Thanks for providing the scripture for us to use! Happy Easter Season! Thanks for sharing this craft for Easter…really helpful to have the Scripture provided! Thanks! I have been visiting your site for a few days now and love all the great ideas. And this one, it is so very special. I will be making these for my kids. Love it! My guys are a little too young for this now but have saved this to use in the future. LOVE IT! What a wonderful idea! Thank you so much for sharing! My kids are going to love this! Thanks so much for sharing this & showing pictures. I’ve heard of it before, but seeing it done made me feel I definitely want to do this! Where do you get a sacrament cup?? And how did you “package” the spices?? I got the sacrament cup from my church, I just didn’t throw mine away after I used it:) I have seen them at restaurant supply stores, though. The spices I just put them in a little piece of that press and seal plastic wrap and closed it up! I used whole cloves, but you could use whatever sweet spice you like. Thanks for the idea! The kids will love it and learn so much at the same time! Love this! I am always looking for ways to teach my little girl the reason we truly celebrate Easter. Thank you. We are going to do this for R.S. thanks so much for the idea. I had a similar one that I used for a scavanger hunt, but this is so much fun. By the way, tell us how you made your 2×4 easter decoration in the background. What font is that? I wish I could say I made the 2×4 craft – I bought it, so I don’t know the font…I will have to get Alison on making her own version so she can teach us! Really it’s cute! We should make some 2×4 craft like that! LOVE LOVE LOVE!!!! I almost bought a set of “resurrection eggs” at Lifeway Tuesday! Love this easy craft and what a great way to teach the “real” meaning of Easter! I LOVE THIS!!!! I’ve been looking for a great teaching tool for the kids for Easter – and this is just perfect. They will love the countdown eggs for sure (and I think it will definitely be more memorable for them than just a coloring page, or reading a book, etc.). Thank you SO MUCH for sharing! We do this countdown every year… only we just do it for family home evening one night or I’ve even used it in sharing time and primary classes. The kids love it and they sit still to listen to the story and see what is coming next! Fabulous idea!! I also love countdowns as does my son. Every year we make a new style advent calendar for Christmas, but I love the plastic eggs for Easter! 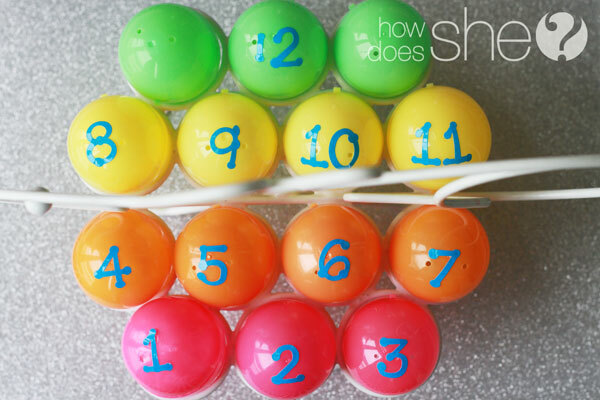 I’m going to try & find an egg holder this weekend so we can make an Easter countdown too! What a genius idea! I always see ways to help kids remember the true meaning of Christmas, but rarely do I see ideas to help them know what Easter really means. I’m totally going to do this! Love love love. PS Where did you get your egg holder? Am I missing something, I haven’t seen these all over. I am so glad you posted this Missy. I was going to go google it and figure out how to make Easter more like Easter. Thanks for the easy copy and paste too. YOu just saved like 2 hours in searching. Thank you!!!! Oh and I totally looked at the #1(2). Missy, you are my hero! this is the BEST. this will mean SO much to my kiddos. i love that your whole crew was in on collecting supplies :). your kids are too cute. and thanks for the shout out. and for making me blush. I LOVE this! So cute and SIMPLE, I can and am actually going to do this. Giving it to my visiting teachees.Thanks!! You have done it again, Missy! The visuals to go along with the words makes it stick in the brain better, not just for the little ones, but for all of us! Love your creativity! We do this every year too at a special Easter morning breakfast. We pass the egg basket around the table and take turns opening while we eat. Kids don’t have to be very old to have fun with this. Mine were 5 and 3 when we started the tradition. Even if they don’t get it all, they like opening the eggs. I also stick a bunch of pictures I kept from a Greg Olsen Christ calendar up on the wall for a visual. Great idea, as usual Missy. Mine could definitely be “cute-ified”. Words cannot express how awesome this is!! Thank You SO MUCH!! My son, Houston, has his birthday party the day before Easter. We are going to do an egg hunt and do this message with the kids! I am just thrilled! That’s awesome! I have the store-bought reversion but I like your better. My kids ♥ our kit. I bought one for my Sunday School class too. They REALLY pay attention & get all excited about it. It helps bring the story more to life for them. Thank you for this! Perfect! Will share with my readers. Fantastic idea to make learning fun using visuals! Thanks, Missy! Super cute! So glad to have you join us for Spring Week! I love the easter bunny doll. is there a pattern available or was it store bought. Thank you for this! I really appreciate it! I’ve already got all my supplies together. Thank you so much for this! We’ll be using it this year for sure.